Google doodle today celebrated the birthday of Pakistan's world-famous cricketer Hanif Mohammad. 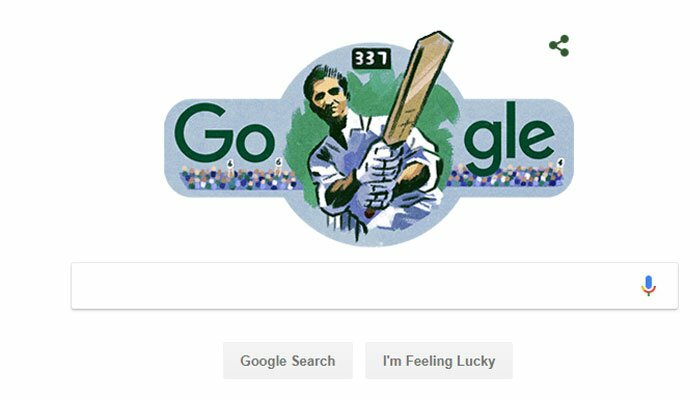 Like always keeping up the tradition Google changed its doodle to honour the late Pakistani cricketer. Hanif Mohammad played for the Pakistani cricket team in 55 Test matches between the 1952–53 season and the 1969–70 season. He averaged 43.98 scoring twelve centuries. At his peak, he was considered one of the best batsmen in the world despite playing at a time when Pakistan played very little Test cricket; Hanif played just 55 Test matches in a career spanning 17 years. He is also known as 'The Original Little Master'. Hanif Mohammad played the longest innings in history (16 hours) he was the first Pakistani to score a triple hundred in a Test match. International Cricket Council (ICC) also wished 'Little Master on his birthday. #OnThisDay in 1921, Pakistan's Little Master was born. Pakistan Cricket Board (PCB) while remembering the most distinguished openers of Test history wrote on their official Twitter handle that Hanif Mohammad was the pride of Pakistan. A lifeless birth anniversary of Bhutto!